Talented people are bombarded with opportunities. So many that yours could easily be lost in the crowd. There’s a simple way to make your opportunities stand out—package your jobs as if you’re marketing a product. I was reminded of this method when I was in the tea aisle of Whole Foods Market. If you’ve never been in their tea aisle, it’s a plethora of color, size, and shape. It’s quite a sight…and a potential sales nightmare for individual suppliers. 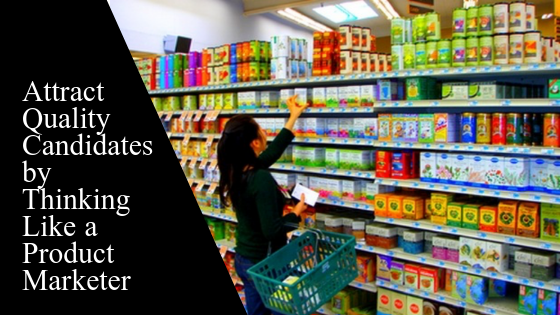 Step #1: Next time you’re in a retail establishment, notice how product marketers package their offerings. Note the colors they use, the pictures they choose, and how carefully and sparingly they use words on the front of the box. Step #2: Imagine your jobs were in a store competing with other opportunities. Each job is in a box, waiting for top talent to come down the aisle. Step #3: Design the “box” with the jobseeker in mind. What pictures, words, and colors can you use to grab people’s attention? Step #4: Test out a few designs with internal staff or an external focus group. What’s this look like in action? A tech company with great opportunities was drawing in a trickle of talent. Using these steps, they created colorful images and short videos (under 10 seconds) of current employees sharing brief soundbites about how working at the company has improved their lives. They used these same soundbites as the opening content for written postings and conversations with candidates. Today, the company draws in a strong steady flow of highly qualified people. It’s been said that talk is cheap. Actually, it’s quite expensive. 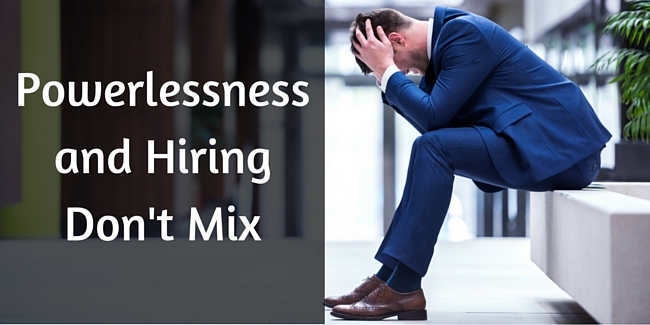 Too much talking can undermine your hiring process, ending up in costly hiring mistakes. In this video, I share three ways to cut down the talking. Did you know that automation could be slowing down your hiring? Why? Because it may not be the right automation. And you may not be using automation correctly for your circumstances. Watch this video to learn the questions you must ask to ensure that you’re engaged in fat-free hiring. Feeling powerless is one of the darker aspects of being human. Whether you’re a parent who can’t stop an illness from ravaging your defenseless child, or you’re at home on the couch watching a television newscast about the latest violent attack in the Middle East, you all—we all—experience powerlessness at some point during life. Much of it, like incurable diseases, can’t be stopped. Some of it, however, like the powerless feeling many people have during the hiring process, can and should be minimized or eliminated. Powerlessness is front and center in my life today as I watch my wife go through a round of chemotherapy. A few months back, this beautiful, amazing woman found a lump—a lump that turned out to be cancer. I’ve felt powerless many times in my life, but this experience beats them all. While I’m grateful to be healthy and capable of being helpful, I’d trade places with her in a heartbeat. I think most husbands would feel the same. They’d gladly sacrifice themselves. I say cut me open. Pump toxic chemicals into me. Hell, I have no hair so I’m already one step ahead. Just don’t make me watch the woman I love and adore go through this. She’s dealt with enough in the past six months with her father dying from cancer and her mom being diagnosed with lung cancer. I wish I could will this feeling away. I wish it were that easy. That’s not possible, though, and therein lies the rub. The way I see it, when you’re feeling powerless you have two options: you can move through it or run from it. The former approach processes the feeling and the latter ignores it. One is productive; the other isn’t. 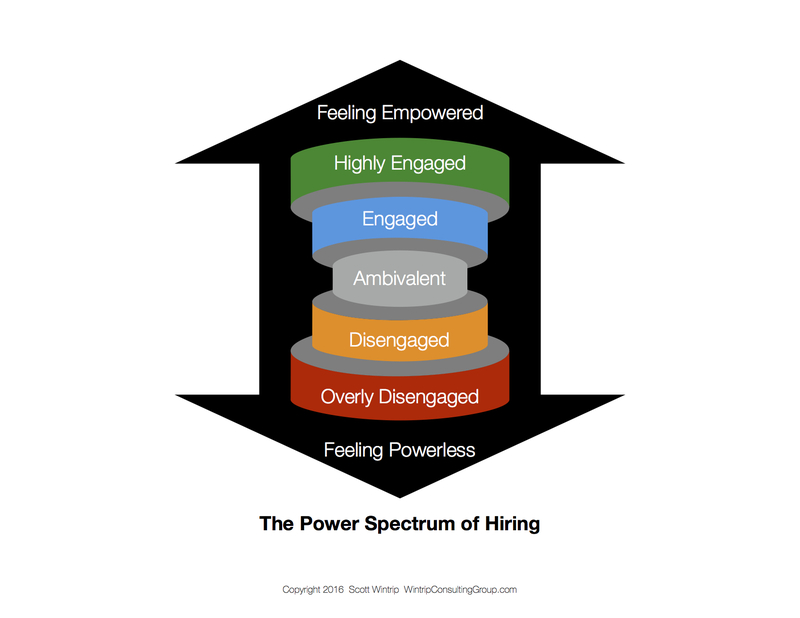 Unfortunately, when people experience powerlessness during the hiring process, they tend to default toward the latter. 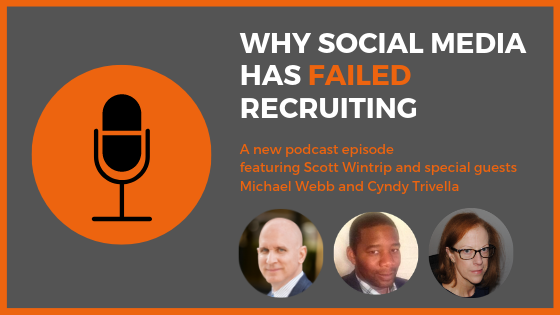 Top talent who can’t get an employer to respond or act quickly will go somewhere else. Hiring managers who can’t get their internal people to fill an open job quickly will look outside the system. Staffing agencies and recruitment firms who can’t get their customers to promptly reply to candidate submissions will shop talent to other customers. It makes sense to cut and run when things aren’t working. It’s easy to understand why people do it. What companies need to understand is that it’s not productive. You can’t run from powerlessness—you have to move through it. There’s a direct relationship between powerlessness and engagement. The more in control the candidate, hiring manager, or staffing agency representative feels, the more invested and engaged they are in the process. A long, drawn out series of interviews makes no sense when you need the seat filled yesterday. It makes even less sense if you want to create an engaging, potent process. One well-planned phone screening is all you need to gauge if a candidate is a good fit. One well-planned live interview allows you to see, hear, and experience if the good fit is a match made in employment heaven. Because of their importance, the three S’s are an integral part of the High Velocity Hiring process I’ve pioneered and rolled out at hundreds of companies across the globe. The results speak for themselves: the retention rate at these companies is more than 90%. Transparency creates trust, which becomes the foundation of a budding employment relationship and solid rapport with candidates, hiring managers, and staffing partners. Share not only how you’re shortening and streamlining your process, but also exactly what will happen during it. You don’t have to give away personal secrets or tricks of the hiring trade you use to ascertain traits like honesty or follow-through. Simply share what, who, when, and why: what decisions and choices will be made, who will make them, when they’ll happen, and why they’re made. When all the stakeholders know what’s happening beforehand, the hiring process becomes fast, lean, and efficient. Unpleasant surprises have no place in a process that begins a relationship, but positive ones are welcome, remembered, and passed on. Surprise candidates by making them smarter during the hiring process. This includes giving them access to educational materials or industry insights. Hiring managers dream of being surprised by faster response times than promised. Staffing partners go out of their way to help customers who skip excessive interviews, trusting both that the firm sent the right person to do the job and will replace them if the hire goes south. Planning surprises ahead of time allows them to be used consistently and generously as a tool for keeping all parties positively engaged. While I’m powerless over my wife having cancer, I can and certainly will remain engaged in the process, doing my part to help her manage her treatment, recovery, and healing. I plan to meet everything head on and move through my feelings of powerlessness. Her prognosis is good and that gives me tremendous hope. The prognosis is also good for companies that do everything within their power to minimize and eliminate powerlessness for candidates, hiring managers, and staffing partners. Those that do won’t have to hope people stay involved—they will because the company made it so. Those that do won’t have to wish the hiring process produced positive results—it will because they made it so. It will happen because they engaged. It will happen because they made it happen. Is Your Hiring Technology Making You Fat? While Miley Cyrus made a similar sounding word famous for all the wrong reasons, Talent Turking is a different set of moves that allows companies to reduce their Labor Factor, the amount of time and effort necessary to generate viable candidates and fill jobs. Decreasing the Labor Factor is a key move in achieving Lean Recruiting—increasing the speed and accuracy of hiring by maximizing efficiency. Even though this was an innovation only in spirit, one of the great innovators of our decade, Amazon, has taken this concept and made it real. Their website, www.mturk.com, allows you to hire “Mechanical Turk Workers,” real people who do tasks with machine like speed and cost efficiency. For anyone involved in recruiting, talent acquisition, or staffing, the applications of this idea are endless. From research to sourcing to database cleanup, these and many more possibilities await, yet, very few people seem to be leveraging this resource. By turking tasks, more time can be better spent talking with candidates and filling jobs. Even Miley would have to admit that this is the right kind of move for anyone wanting to operate more efficiently. We live in an on-demand world. Every day, we access more and more products and services at the click of a mouse, touch of a button, or by dialing our phones. Many companies have installed apps, websites, and other devices allowing their employees to order food, report updates, and procure supplies the moment they are needed. This same convenient access must be applied to acquiring talent. “Downloading” the next hire should not be a reactive process where people access resumes to begin a search. Every company can increase the flow of candidates. When a more substantial pool of talent is combined with better selection, interviewing, and quality checks, companies can build a Talent Inventory, people that are ready to go the moment they are needed. Quick and decisive hiring (filling roles with greater speed, more accuracy, and less effort) should be a non-negotiable standard for leaders to keep their jobs. In a recent Q&A, Leah and I discussed how the growth of the on-demand economy is impacting how hiring is done. Read on about this growing trend and how you can prepare. Leah: What do you see as the biggest trend that will impact the talent industry in the next 5-10 years? Scott: The next 10 years will focus on instantaneous hiring. Time-to-fill should be zero. However, it reached an all-time high this year – over 26 days. It’s no surprise that jobs will open through resignations, terminations, transfers and business expansion. What is surprising is how few companies have created a system to immediately deliver talent exactly when and where it is needed. Quick and decisive hiring (filling roles with greater speed, more accuracy, and less effort) is becoming the new standard to combat this issue. Leah: What evidence are you seeing of this trend making an impact already? Scott: More and more buyers are demanding faster results. Why? They find waiting for talent unacceptable. In an organization, an empty seat is like an open wound. It’s a painful distraction that interferes with the business’s core mission. When there’s an empty seat, the work must either be redistributed or left undone, resulting in stress, costs, delays, and lost opportunity, as well as lower revenue. We live in an on-demand world. Every day, we access more and more products and services at the click of a mouse, touch of a button or by dialing our phones. In order for staffing and recruitment firms to remain relevant and competitive, this same convenient access must be applied to acquiring talent. Leah: How can organizations prepare for this trend? Scott: First, they need to understand what slows down fast hiring. Especially if they hope to change this in their staffing firm. And, to get their customers to make faster decisions. To combat these problems, staffing companies and recruitment firms need to stop using methods that are reactive and, instead, follow a process that allows them to fill jobs and assignments the instant they open. Leah: With this approach, what type of results should firms expect? Scott: The ability to fill jobs and assignments in an instant, which I call High Velocity Hiring(SM), makes the competition, who can’t do this, irrelevant. Just like Netflix turned video stores, like Blockbuster, into unsustainable enterprises. Firms who can deliver instantaneous hiring end up with larger market share and higher margins, both resulting from happier customers. Leah: Can you share any examples or lessons learned as you’ve helped firms provide instant hiring? Scott: Being able to deliver people on-demand becomes a healthy addiction. People who make this their way of doing business, keep doing it this way. A good example is Beth Casey-Bellone. Over a decade ago, I showed her and her team at a staffing and outsourcing firm in New York how to move away from reactively filling jobs. Like many companies in the people business, they always needed good candidates and never seemed able to find enough. As a result, filling openings often took days and, in some cases, weeks to fill. I helped them improve their Candidate Gravity, their ability to pull in quality people much more quickly. Also, how to employ Talent Manufacturing to build prospective employees before they are needed. They filled jobs and assignments, using their Talent Inventory, in minutes.